One of the most inexplicable Bob Dylan appearances of any time or any place is his mysterious guest spot on Dharma and Greg on October 12, 1999. Dharma and Greg was one of those inexplicably popular shows (it followed Who Wants to Be a Millionaire at the height of that show’s ratings ascendancy) that ran for five seasons on a very thin premise, weak writing, a generally amiable cast, and very little inspiration. Jenna Elfman was the pixie-ish star, but most of the rest of the cast around her was funnier, though not by very much. 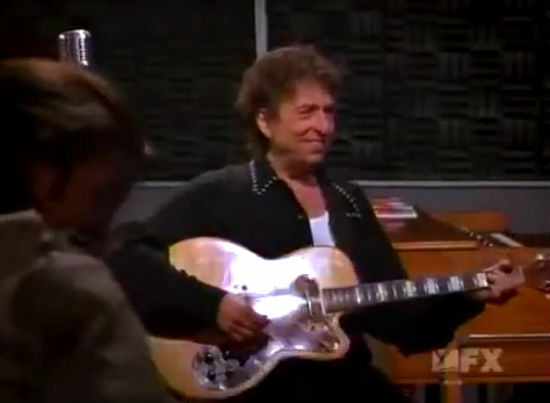 The episode with Dylan (“Play Lady Play”), which I just watched here, is really quite bad. The plotting is at a level that you would expect to find on The Brady Bunch – it is all very heavy-handed and ham-fisted. At a time when Seinfeld was on the air, this was a very backward-looking type of sitcom. Dylan smiles. He kinda laughs. He genuinely seems to be enjoying himself in a way that you rarely see Dylan enjoying himself. It’s just sort of odd. Elfman is clearly in heaven about the whole thing too. I have no idea – none at all – what would have attracted Dylan to this show, or who he might have known to get him hooked up with it. I suppose it is always possible that he was just a fan – I really, really don’t know. 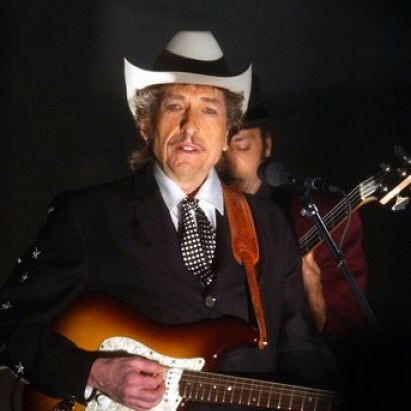 The appearance wasn’t advertised in advance – you can find postings on Dylan mailing list alerting people on the west coast to turn in – and it was just a surprise thing for the die-hard Dharma and Greg audience, whomever they must have been. It’s Dylan’s first appearance on a sitcom, and one of his (at this point) very rare acting roles. It’s all just kind of mystifying to me. I guess he liked Dharma and Greg. Elfman was related by marriage to Danny Elfman of Oingo Boingo fame. Maybe there’s a connection there? I don’t remember who it was, but Dylan appeared as a personal favor to someone who worked on the show (not an actor). It shouldn’t be too hard to track down, as it has been published in the past.